Thanks to Intense Pulsed Light (IPL), it really is possible to remove signs of sun damage and aging from your skin. Also known as photorejuvenation, IPL is a treatment that uses light energy to heal and revitalize the skin. Sunspots, unwanted pigmentation, small blood vessels, redness, and other problems can all be resolved with state-of-the-art IPL technology. An IPL treatment uses high-powered technology in the form of a versatile handpiece to deliver potent broad-spectrum pulses of light into the skin. As the IPL light beams pass through your skin, the light functions in two different ways to improve the appearance of your skin. As the IPL laser emits a range of lightwaves into the skin, the light energy targets hemoglobin and melanin in the skin. 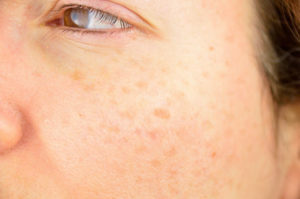 Hemoglobin is responsible for the appearance of blood vessels on the skin, while melanin is responsible for sunspots, brown spots, and discoloration. The light beams are absorbed by either hemoglobin or melanin to either damage the blood vessel wall or fragment the melanin pigment. The blood vessels and melanin pigments then become less visible because they are absorbed and flushed out by the body. The result? Brighter, healthier skin! IPL photorejuvenation delivers the best results when completed once per month over the span of three to five months. You can expect to see subtle improvements after each treatment, with the most defined results appearing after five full treatments. This completely noninvasive treatment only takes between 30 to 90 minutes to complete, depending on the size of the treatment area. A cool gel is applied to your skin before treatment to ensure comfort, and without any downtime to worry about, you are able to reapply makeup and return to your normal routine immediately after your appointment. The IPL photorejuvenation is the ultimate treatment to help you eliminate signs of sun damage and embrace healthier skin. Call Tampa Laser Hair Removal at (813) 773-0804 today to schedule your IPL appointment and welcome summer with vibrant skin you love.